Why is everyone staring at your feet? Dress sneakers with a suit are stylish now, right? Right, but you may still have some questions. Are these the wrong kind of sneakers? Am I styling them wrong? Can I really wear them with a suit? Why didn’t I do more research? Fear not, gentlemen. If you’re thinking of taking the dress sneaker plunge, I’ve got the info you need. 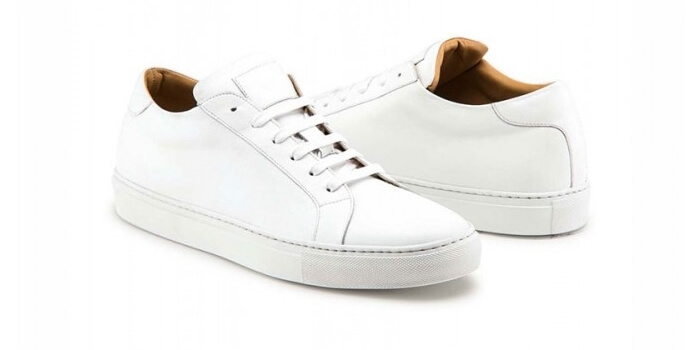 Dress sneakers are outrageously popular right now, and with good reason. 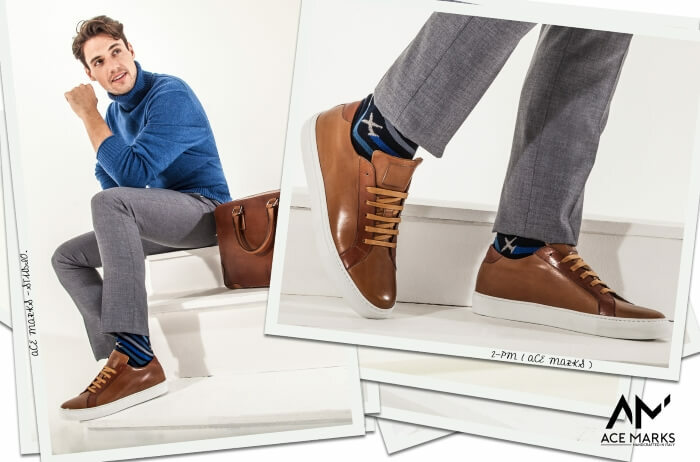 Who wouldn’t want to mix the comfort and casual charm of sneakers with the power and distinction of dress shoes? The trouble is, they’re a very new phenomenon, so most men don’t know the rules. Today we’re going to talk about what makes a sneaker a dress sneaker so you won’t pick the WRONG sneaks. Then I’ll give you clear tips and specific outfit ideas so you’ll know how to pair them with a suit or smart-casual attire. This article is brought to you by Ace Marks – the cult brand behind the most funded shoe Kickstarter in history. 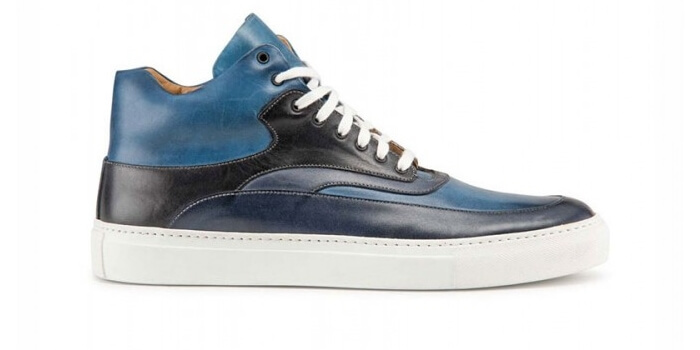 They’re cutting out the middleman to bring you $400 luxury dress sneakers for more like $200. 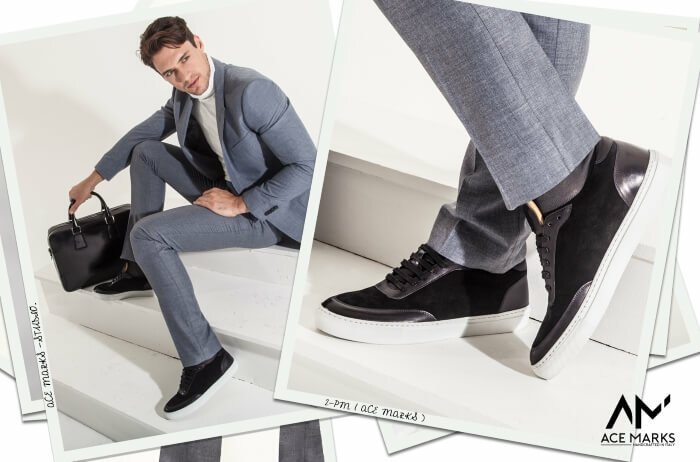 Ace Marks sneakers are handcrafted in Italy by a family of 4th generation master craftsmen from the same full grain calfskin found in top quality dress shoes. Click here to check out Ace Marks dress sneakers and use code SNEAKERS for a special discount. #1. What Are Dress Sneakers? Sneakers are shoes with no heel and a pliable rubber sole. You’ll notice that definition tells you zero about what the upper looks like. Click here to grab these sneakers from Ace Marks. There are clear rules for classic dress shoe formality. You just need to know the hierarchy. But what about dress sneakers? How can you avoid looking like a suited-up jogger? Leather or suede (more rarely, canvas or synthetic). The finest dress sneakers are made with top-quality dress shoe leathers. Wearing sneakers with a suit doesn’t just call for the right sneakers. It also calls for the right suit. Go for a slim cut suit. The more neatly tailored it is, the better it’ll look with sneakers. This shows that your look is an intentional statement and that you didn’t just forget to put your oxfords on. Click here to check out the full range of Ace Marks sneakers. Picking up a color in the sneaker looks good but keep it subtle. For example, a gray sneaker with a blue sole or laces looks better with a navy suit than a blue sneaker does. If you were wearing regular dress shoes on the weekend, you’d most likely be wearing loafers or double monks. So treat your dress sneakers the same way: wear them sockless or with no-show socks. You CAN dress the suit down with a t-shirt underneath, but an untucked mandarin collar shirt does the job with more panache. Again, think ‘intentional statement’. Your sneakers are your main accessory here. Let them do the talking and keep the rest of your outfit simple but sharp. Try a crisp white dress shirt (no tie: a white shirt with a tie is better suited to a job interview than a party) and a pocket square with a hint of pattern or color. The rules of matching dress shoes with suits apply here, but there are more colors to play with. White is the most popular but black, burgundy, or gray is more versatile for a first dress sneaker. You CAN get dress sneakers in brighter colors but you risk clashing or looking childish. A bold texture in a neutral color will ‘pop’ just as effectively. Pair a sports jacket with either a polo shirt, a graphic knit or roll neck, or a shirt with a slim or knit tie. Try echoing a color or texture from your sneakers, e.g. a pale blue cashmere sweater paired with navy suede sneakers. For trousers, go for a slim fit and try dark blue jeans, earth-toned chinos or pale gray dress slacks. If you want to show off your sneakers, roll your trousers instead of cuffing or stacking them. Heavy and dark overcoats are too wintry for sneakers. Try a camel jacket or light trenchcoat instead. Remember that your sneakers are your main accessory with this look. Keep the rest of your outfit subtle and stark, but sharp enough to look intentional. 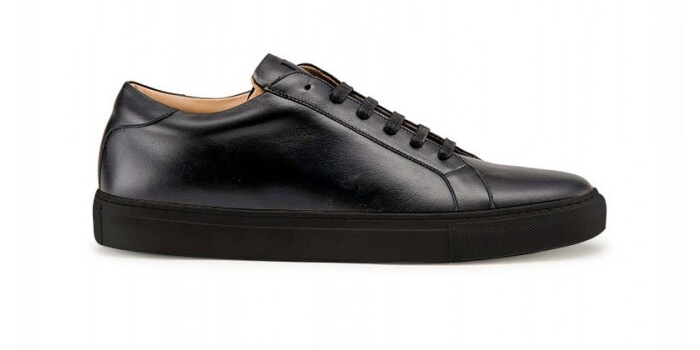 Best thing about leather dress sneakers? The COMFORT. Every Ace Marks sneaker has a pillow-padded tongue and collar, full calfskin lining, and shock-absorber insoles. It’s like wearing fluffy slippers with your suit. Most sneakers have glued-on soles that come unstuck. Ace Marks are stitched like dress shoes so you get more wears for your money. Click here to check out the Ace Marks sneaker range and use code SNEAKERS to claim your exclusive discount.